I have been mean to Daniel Cook in the past (oh yeah, it goes way back doesn’t it). It was probably mostly undeserved, seeing how how he was one of the inspirations for this blog in the first place. It feels especially awkward when he releases something as cool as “Fishing Girl” (together with Eric Woroshow). If you follow his Blog it might remember you of one of his challenges. “Fishing Girl” is just that. Polished to the max. It’s 10 Minutes of very carefully designed, very well-crafted game design with very simple goals. It has almost one-button controls. It has some mechanics that allow for surprising depth. It has a cute surprise ending (which they give away in the Trailer! Thank god I haven’t seen it before I played it! Don’t look!) and it costs only 1$ (80 MS Points) on XBLA Indie Games. If you have an Xbox, what are you waiting for?! I really love the idea of having a very short, simple experience and just putting all the effort into making sure it works perfectly. It’s a very refreshing approach in a world where “20h+ of Gameplay” is considered a good thing. In the end if I had to come up with a critique I would maybe ask for more meaning, more thematic depth. Right now it’s a little superficial cuteness. But I won’t. Ask me again after they released their 5th game. Because it would make me very happy if they would. Thank you Daniel! Thank you Eric! I’m glad you had such a good time with Fishing Girl Krystian! Your analysis really hit home: my goal with Fishing Girl has always been to provide a simple set of core mechanics that are simply fun. 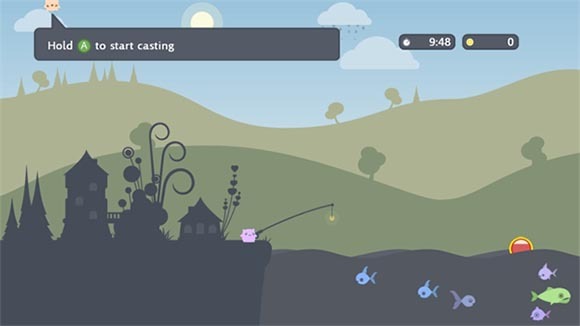 I also wanted to point out the other versions of Fishing Girl that were born out of the prototyping challenge: http://lostgarden.com/2008/12/fishing-girl-prototype-results.html. It’s a lot of fun to compare and contrast the variations on a theme. Despite the common parentage I’m surprised how different the games are. None of the versions are really the same game. Yeah I noticed the other versions researching the links. I will check them out. Superficially comparing some of them, I noticed that your version in particular has some quite interesting advantages. For example, I like how the fishes move slowly and how they are close together and in-sight so you can plan ahead. I played a flash version where fish were moving very fast and were off-screen most of the time. Catching is more of a chance there. I agree, It’s really fascinating. I will dig into it some deeper. And I really love the Ending. It caught me totally off-guard. Btw, you have in-game badges but no Xbox Archievements. Is that a limitation of the XBLA Indie Games interface? Oh yeah, I wrote that Daniel released it together with you. But now I was wondering: is that correct? Did you guys work on this together or is it more your own project based on his Challenge? Unfortunately, Xbox Indie Games aren’t allowed to award achievements or gamer points. That’s something I don’t think will ever change. My version of Fishing Girl is mostly my own work. Certainly all the code is mine, and I took the basic art assets them and tweaked them in various ways. But Daniel Cook was definitely the guiding hand with the initial design and throughout the process. He, along with many other play testers, provided the feedback I needed to refine the mechanics.